Since the Fall of 2017 NDC International has been representing Haecker Automation in North American. Haecker is a family-owned company from Germany that has provided future-oriented solutions in microsystems technology for over 20 years. They operate worldwide in the fields of micro assembly, micro and nano dispensing as well as in micro laser soldering. The OurPlant Assembly platform is an innovative system with a modular setup that can take you from idea to series production quickly. This machine provides the right processing equipment for each phase of the production cycle by integrating various “plug & play” extension modules. With this innovative system, various micro assembly applications can be handled by this one high-performance machine. Haecker recently announced a new module in the OurPlant line-up – the OurPlant Pocket. 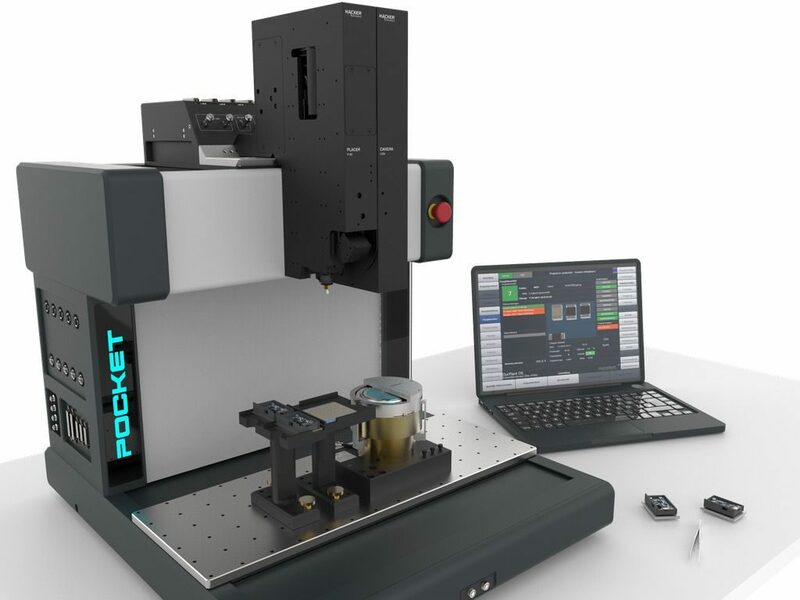 This compact machine can handle semi-automated processes and provides developers with an excellent platform for testing, developing and validating their processes. The OurPlant Pocket can be equipped with up to two processing heads and different modules to accomplish various tasks. It enjoys compatibility with the OurPlant platform and benefits from its wide variety of modules. Processes can be transferred to all other OurPlant systems. Plus, thanks to its small footprint of 55 cm x 66 cm, it is the perfect solution for a developer workstation, but also for semi-automated production in small series. Contact us today to learn more about the innovative OurPlant Pocket!